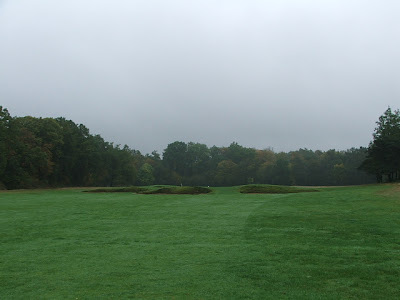 It is hard to describe Golf de Chantilly properly without describing its location. You get there by taking the A1 motorway north, out of Paris, and then by driving through the thick forest in Chantilly. It is a centuries old town with the perfect french château in the middle, surrounded by a moat. As you leave the forest, the streets turn from pavement to cobblestone. You then approach a big cobblestone round-about, and the famous race-course is directly in front of you. To your right, down the hill is the imposing château. You have to drive past the château and through the old town gate to get to the golf course. Like at Morfontaine, you have to pass through an electronic gate to get into this private course. 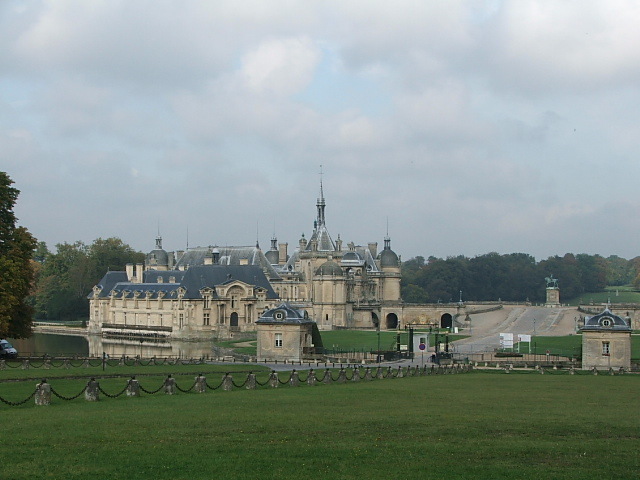 The château and the great stables at Chantilly were featured in the James Bond movie A View to a Kill. Chantilly has the world's largest concentrated area for trainers and racehorses. I played at Chantilly this past October, during the week of the races, and the area has a regal atmosphere. It is a spectacular sight to see the locals on horses galloping through the beautiful surroundings and forest. When we were at Chantilly, there were elegantly dressed people on horseback riding through the narrow allées carved in the forest. One guy was decked out in all his Sunday best, including a curved hunting trumpet strapped around his chest. Although Chantilly is not ranked on the world's top 100 list I am playing, I jumped at the chance to play this beautiful course when offered. As my readers know from my Morfontaine experience, I am a huge fan of France. 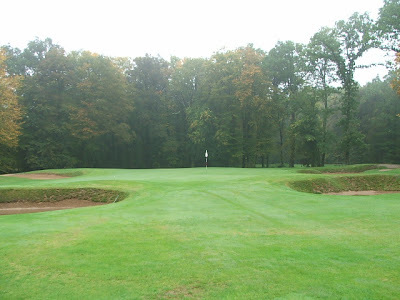 Chantilly was also designed by the same architect as Morfontaine, Tom Simpson, whose courses I absolutely love. 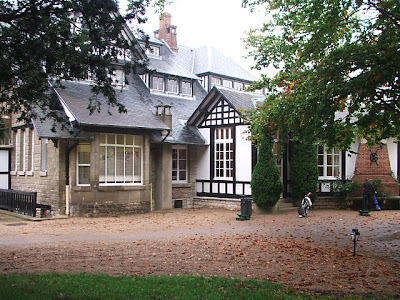 Like most of the elite french courses, the history here is intertwined with the aristocracy. Golf de Chantilly was founded by a local prince in 1909. Baron Edouard de Rothschild was the president of the club from 1927-1940. Like at Morfontaine, Chantilly doesn't open until nine o'clock in the morning. Perhaps it's related to the 35 hour work-week the french have, but it seems a bit odd to give up a couple of great dawn hours when you could be playing. C'est la vie. Golf began at Chantilly in 1909, when a nine hole course was laid out. Tom Simpson was brought in to re-design the original course and design a new eighteen hole course in the 1920s. 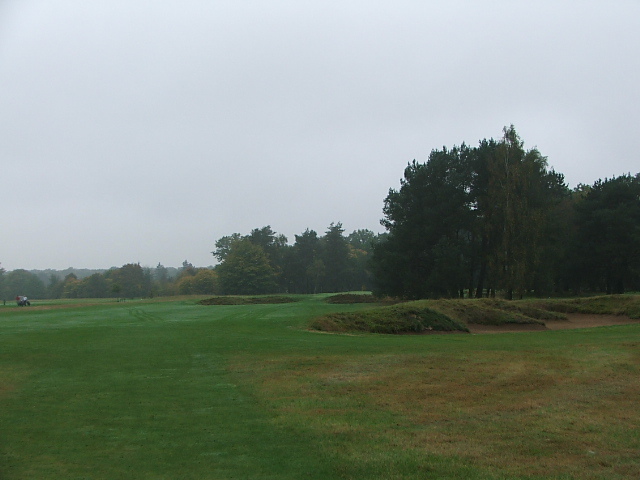 Unlike Morfontaine, Chantilly was heavily damaged during the Second World War, and nine holes were abandoned as a result. In the 1980s Donald Steel designed thirteen new holes and integrated them in with nine holes from the earlier Longeres course. There are 36 holes at Chantilly today: the Veneuil course, which has most of the original Simpson holes, and the Longeres course. 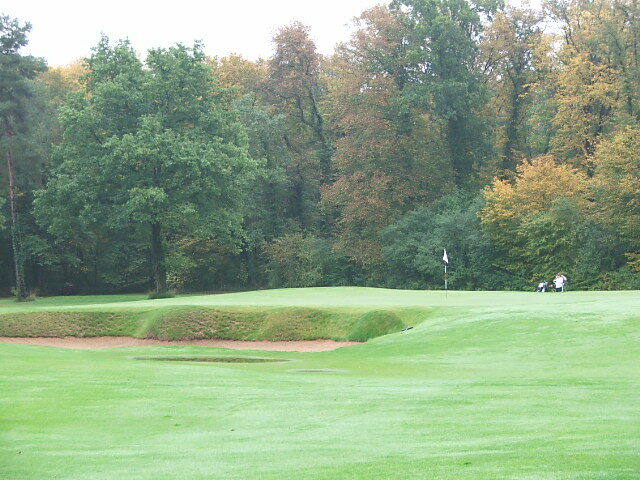 They play championships on a composite "Vineuil Old Course" which is made up of fourteen holes from the Vineuil course and four from the Longeres. 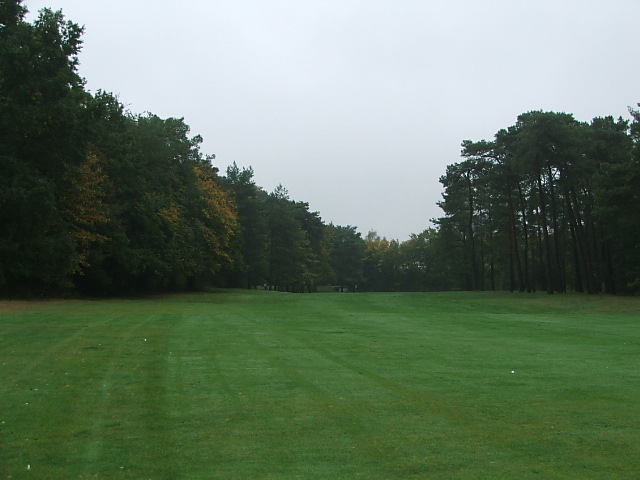 The course has hosted the French Open championship ten times. Nick Faldo won twice at Chantilly. Other winners include Roberto de Vicenzo, Peter Oosterhuis and Arnaud Massy. Some courses ease you into the round, and it takes awhile for you to find the courses' charms. Not at Chantilly. It announces right away that it will be a great round of golf. The opening par five hole shows the strategic use of bunkers that are present throughout the course. 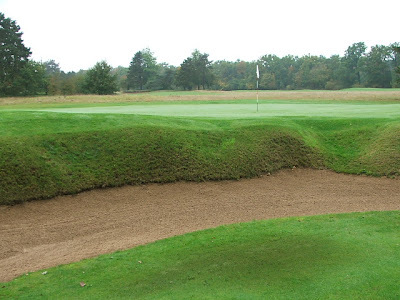 The three bunkers on the right side make the only safe shot one that lands in the middle of the fairway, right of the clump of trees guarding the left side of the hole. The 159 meter par three, third hole shows off the great bunkering at Chantilly. 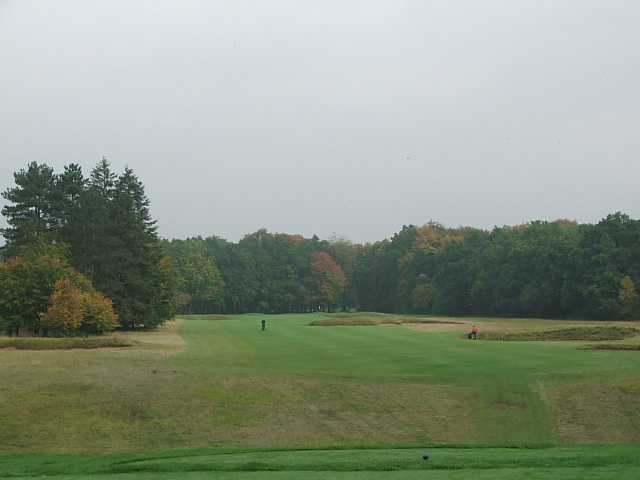 The routing at Chantilly is varied and interesting, and although you are in a dense forest the fairways generally aren't choked with trees (the fifth hole below is an exception). 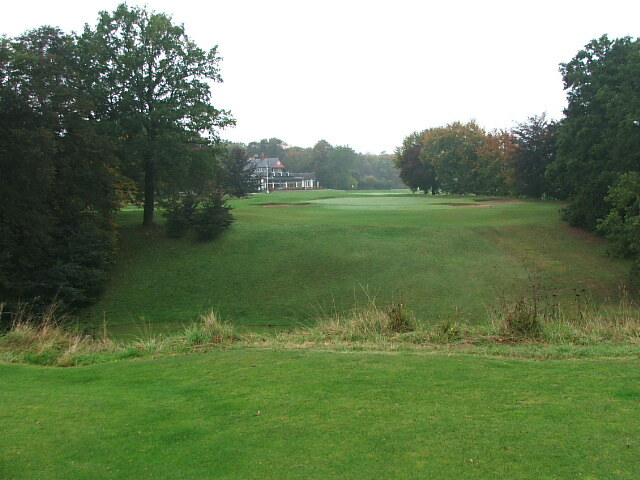 The World Atlas of Golf describes looking down the fairway from the fifth tee (seen above) as the golfing equivalent of looking down a gun barrel. It plays as the #1 handicap at Chantilly and is a tough hole through a tight chute of trees. I was very pleased with my par. The dog-leg right seventh hole reminded me of playing at Garden City on Long Island and Myopia Hunt Club in Massachusetts, with its flat terrain, fescue and bunkering. Both the front and back nines at Chantilly have back-to-back par fives. The back nine is the clearly superior of the two, with the six stretch of holes twelve through seventeen being very good. The thirteenth hole was my second favorite on the course (after the 17th). It is a 400 meter dog-leg left (below) that demands you hit your tee shot over two large cross-bunkers. Your second shot is then to an elevated and well-bunkered green. 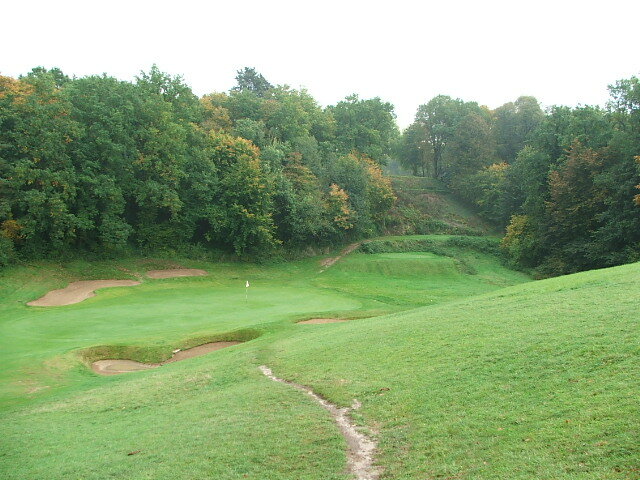 Like at Morfontaine, the feeling on the course is one of complete solitude and isolation since it is located in a dense forest. The sixteenth hole is a dogleg left that starts out simple enough. As you walk up to your ball you see that you have to hit your second shot over a ravine to the green. 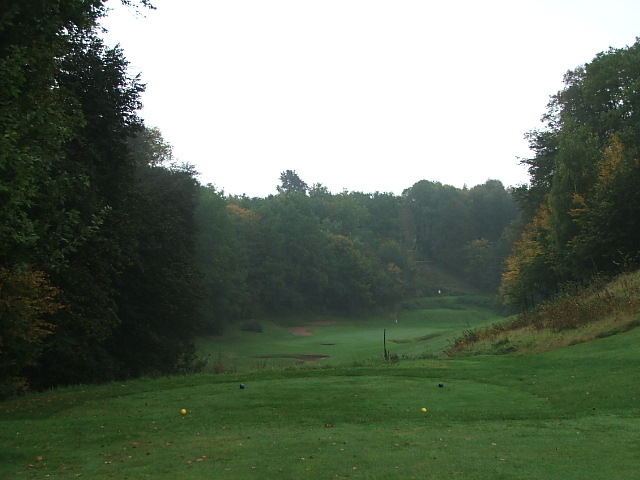 The ravine is interesting, it is about 50 yards long and, unusually, has a fairway at the bottom of it. The second shot plays through the trees toward the clubhouse in the background. Chantilly now offers a startling discovery. It is hard to describe just how good the seventeenth hole is at Chantilly. For those that remember the original Planet of the Apes movie with Charlton Heston, remember the sensation, the chills, and sense of surprise you got when the camera pans over and you see the top half of the Statue of Liberty. The same type of feeling overtakes you here when you realize there is a hole located where the seventeenth is. Shock and awe. It is a stunning par three that plays 199 meters from the back tees down into a tight tree-lined valley. There is an extremely steep hill on the left side of the hole and a large slope on the right side. It is somewhat reminiscent of the par three fourteenth hole at Pine Valley, but without the water in front. Chantilly is basically a flat course, but when you get to the seventeenth tee, the hole is at least sixty feet below you in an enchanted setting. Like both the Valliere course at Morfontaine and Cruden Bay, it shows off Simpson's absolute genius in hole design. How he pulled this off is amazing. The World Atlas of Golf describes this hole as being located in a "secret dell," and I think it is an apt description. The prior sixteen holes give no hint of what the seventeenth hole will be like. It really is surprising and inspiring. Unfortunately, I got stains on my pants when I dropped to my knees after seeing the hole and started to shout, "Damn you, you maniacs...," but there were tears of joy running down my face! The next hole, the par four finishing hole, has the most difficult walk to a tee box anywhere in the world (you can see it in the back right carved into the trees in the picture below). The walk to the tee box is without the benefit of a stairway. You have to walk up a steep mountain to a tee located behind the seventeenth green. There is a small rocky path winding up through the trees that gives your calves a workout. After you hit your tee shot over the seventeenth green to the fairway on the other side of the valley, you have to navigate your way back down the sharp incline, across the valley and then up the other side of the steep hill to get to the fairway. After playing seventeen, eighteen is a bit of an anti-climactic hole, but none-the-less, Chantilly is a great place to play golf. Like at Royal Dornoch, Chantilly only allows two balls before eleven in the morning. It really is a great way to play and the pace of play is fantastic. I played some of my best golf at Chantilly, and our two groups were essentially the only four people on the course in the morning. It was easy to get into a rhythm playing this fast with no distractions. We played on a damp, misty and un-seasonably warm autumn day shrouded in heavy fog that lifted about halfway through the round. Although I shot a good score, the other two people on the trip with us, who were playing in front of us, played off-the-charts. How is a 64 from the back tees? Well done, Mark! Either French people don´t play a lot of golf or Morfontaine and Chantilly are really exclusive clubs, since we barely saw anyone on either course during our mid-week rounds. 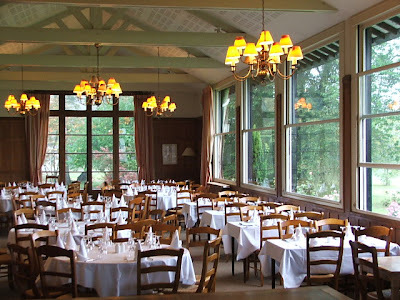 We stayed for lunch after our round, and although the clubhouse at Chantilly doesn't have the same charmed feel as Morfontaine, it is a nice quaint clubhouse that overlooks the vast property. In England or in the U.S. you often see people having a couple of beers after a round, in Scotland during the round, and in a classic French move, here, it's a bottle of Bordeaux after the round. While we lunched on French fries with vinegar several members were lounging around having a leisurely lunch over a bottle of red wine. Chantilly's web-site is helpful, but a bit rough on their translation into English. Among other things stated in the dress code are "no long-line bra nor straps for women." Perhaps short-line bras or strapless bras are permitted? Again, your infatuation with French is very apparent. It is amazing to me (and others?) that you rank the people so highly. You have the audacity to diss both the course as over-rated and the people at Fisher's Island as blue blood snobs, and yet you place French golf and it's American hating people on a pedestal. Why? Are you French yourself? What an ignorant, xenophobic comment by MacBoube. One of the things I have learnt from this entertaining blog is that great golf courses do not recognise borders, class or time. They are usually the works of visionaries who make the best of the land they work with. The fact that you can have such beautiful courses in California, Oregon, NY, Scotland, Ireland, Japan, France, Australia etc... is testament that golf can rise above such petty hatred and fear. Next time you tie yourself in knots about the French, ask yourself two simple questions..... 1) Why do some Americans feel that so many countries hate them (even though the truth is very different)..... 2) Where did the great beacon of American freedom the Statue of Liberty come from? I'll give you a clue... its original name was "La liberté éclairant le monde"
Chantilly is a nice place,a really nice place. i played there as a child almost everyday of every holiday - the people there are some of the nicest and most generous you will find. the infatuation with the french and english has gone on for centuries Macboube - you only have to say bonjour to an american lady and their draws come off! !